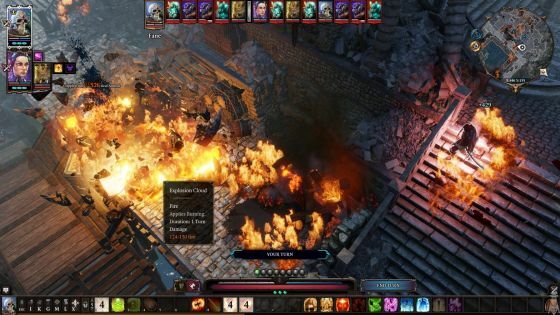 In 2014, Larian released Divinity: Original Sin to critical acclaim, and got a rare 5/5 in Corwin's review here at the Watch. 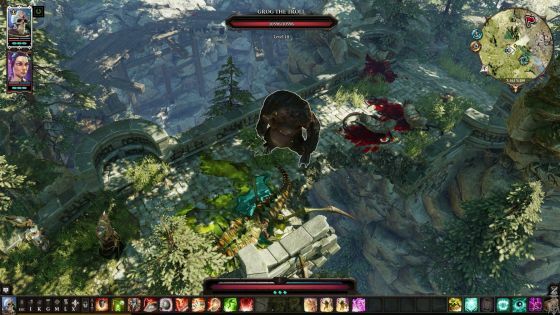 In order to achieve their goal, Larian resorted to Kickstarter, where they gained about a million dollars in a hugely successful campaign. That campaign also lead to a rather interesting Watch VS Codex quest in the game, where Myrthos lead the Watchers in their hunt for the renegade imps of the Codex. Now, after obtaining two million dollars in another very successful Kickstarter campaign, the sequel has finally arrived. The big question is: Could it actually live up to the standard set by the original, especially considering the original was one of the best RPGs in recent years? The short answer to that question is: Yes, mostly. It's actually better in most ways, but it lacks the polish of the original, probably because the scope is greater. For a longer, more detailed answer, we need to take a good look at the actual game. Note: The co-op system is still present, and there's a new Dungeon Master system in place as well. However, it's something of a stand alone module that I haven't tried, which is why it's not present in the review. 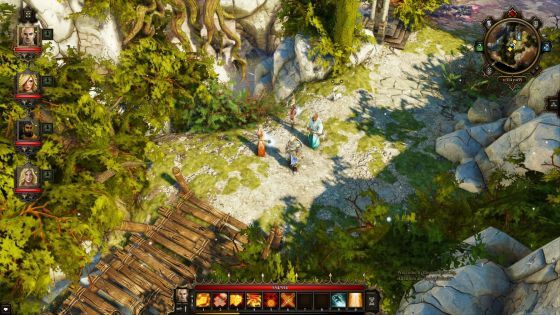 In Divinity: Original Sin, we created two main characters at the start of the game, and could then recruit up to two more during our travels. There was also an option to pick a "Lone Wolf" talent which increased your overall stats, but lowered the maximum party size by 1 (so 1x Lone Wolf + 2x regular members, or 2x Lone Wolf + 0 regular members). It was quite an interesting mechanic, leading to a lot of possible party setups. You now only create one character. The others are recruited. You can select an "Origin" character now, which has a real personality and mission when you start the game. This affects dialogues and events, similar to the origin stories in Dragon Age: Origins. It really does have a significant impact, so it certainly adds replay value. Characters now have "tags", most of which are obtained in the start, but a few can be gained over the course of the game. Tags enable you to complete quests and dialogues in different ways, and it's highly recommended to have a good combination of tags in your party. For example, both "Scholar" and "Mystic" is required to decipher and learn a certain potion recipe, which is the only way to get the most out of a particular quest. Other quests can only be properly solved with "Soldier", "Noble" and so on. There is no stat to increase the amount of action points you have per turn. A few skills, such as "Haste", will increase it, but other than that you'd need either the talents "Lone Wolf" or "Glass Cannon" to increase your action points. "Lone Wolf" now only works when the party consists of one or two members. In other words: If you are going for a Lone Wolf character, always get 2x Lone Wolf, and never 1x Lone Wolf and 1x regular, as that would simply weaken the party significantly. There's less of a mix'n match approach than in the original, but having played the game with both a full party and a 2x Lone Wolf party, I can confirm that 2x Lone Wolf is not only viable, but probably stronger than a full party through most of the game, but only once you're familiar with the game mechanics and can build them somewhat correctly. And finally, the main character can now be one of five races (human, lizard, dwarf, elf and undead) instead of just human. Each race opens up new dialogue options and has a few, minor racial abilities. The biggest difference is undead, who get wounded by healing spells and healed by poison spells, which adds an extra element to consider in combat. The combination of origin, tags, race, skills, talents and even party size means there's an almost unprecedented level of customization and experimentation related to character development. Even the original didn't have as many options, and it was already exceptional in its day and age. It really is a nod to the old PnP games, as well as older RPGs inspired by such PnP games, as it's bound to spark similar discussions on what type of character to create, how to set up the team and what choices were made along the way. Turn-based combat brings a lot of tactical elements into every battle, but it comes at the cost of battles being long. In tactical turn based combat you want each battle to be challenging, a small puzzle to solve - otherwise it becomes boring. So you as developer will struggle with ordinary battles - make them easy and it is boring, make them hard and you exhaust the player. Even if you manage to solve this, turn-based combat will still require a lot of attention from the player and this attention will not be spent on anything else. It's obviously easier for games of a smaller scope, as you're not as likely to run into issues like exhausting or boring the player, but Divinity: Original Sin 2 has a massive scope; even my replay took well over 50 hours, and the first run was considerably longer. 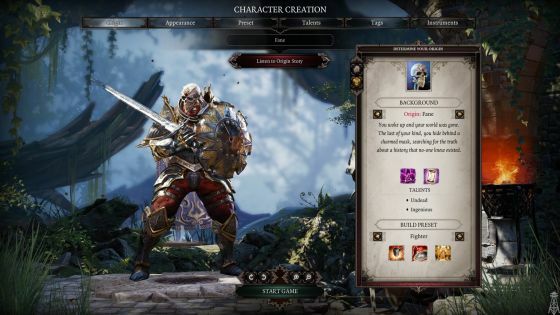 That being said, Larian has already succeeded in creating and refining a system that works, in the enhanced edition of Divinity: Original Sin, so it's no surprise that they've done it again. Overall, the combat system is challenging, tactical and with lots of options. However, there are still a few, drawn out fights here and there, just like in the original. This is especially the case on higher difficulties, so if you're not a particularly patient player, it might be a good idea to stick to "Classic" or "Explorer". The main reason the combat works well, even over time, is the amount of variety found in the game. Early on, it might seem very straight forward, but if you're willing to experiment a bit over time, as you gain new skills and spells, you'll find new combinations and possibilities that simply aren't obvious. What's better than a fireball? A fireball with height advantage! For example, height advantage is a new feature which is fairly easy to take advantage of, but using healing spells to damage enemy undead might not be as obvious. In a similar fashion, the new Source system (you get a limited amount of Source to use for the most powerful spells) might seem straight forward, but getting the most out of it requires quite a bit of practice. Another change that will take some time to get used to is a "Mass Effect 2" style protection system, where it's impossible to use crowd control abilities while someone is protected. A consequence of this is that the "Constitution" stat is almost worthless, as it's much better to simply target gear with the right protection. The original didn't have any of that, but it did have a stronger sense of progression, mainly because there were efficient ways of gaining additional action points. Now, you're basically stuck at four action points for normal characters and six for Lone Wolves or Glass Cannons. Sure, there are certain consumables and skills that can help you gain a point here or there, but it's not enough to drastically change how the fights play out. Also, combat no longer uses "initiative" in the same way that it used to: A common tactic was to give the entire party a high initiative rating, enabling you to make all your moves in a given turn before the enemy could do anything. The new system is more fair in that initiative only determines the order of your characters, and whether or not your character with the highest initiative gets to go first or second, behind the enemy with the highest initiative. Beyond that, it's simply every other turn, except for summoned creatures, who immediately get a turn right after they've been summoned. It's still a great system, and combat is both fun and challenging, but I would have preferred a slightly stronger sense of progress coming from the actual characters, and not their gear. As it is, the main difference between level 15 characters and ones at level 21, is a massive leap in terms of gear. In fact, gear makes a much bigger difference here than in most RPGs, so it's well worth checking vendors every time you get a new level up, as they'll have a new set of items ready for that level. In terms of combat, I found myself preferring a party consisting of two Lone Wolves rather than a full party of four. It's easier to maintain their gear, and the extra action points means they can do quite a bit more than most characters. The overall amount of action points in the party is lower (12 vs 16), but the characters using them are vastly stronger, giving them a sense of being truly powerful compared to their enemies. However, I actually wouldn't recommend it for anyone who's new to the game, as it means missing out on additional companions, who add quite a lot to the game. The overall writing is excellent, and the companions are a very good example of that. 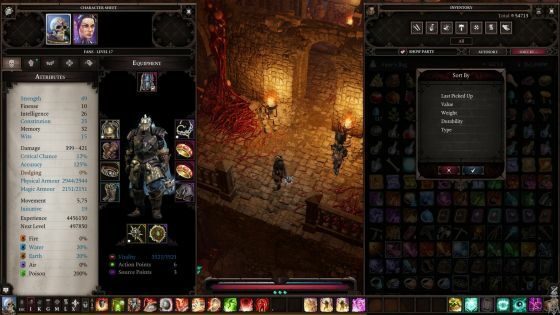 Larian did something unique when writing companions: They essentially wrote six characters, each with their own personalities, their own quests and their own backgrounds, and then they let you play one of them, and recruit up to three out of five of the others. The origin stories that you can choose during character creation are actually one of the cast, and you get to step into his or her role, in addition to the role as the leader. You can also choose to customize a character, or recruit customized companions, but that means missing out on quite a lot of interesting dialogue and side quests. The only problem with this approach is that the characters are so involved in what's going on that you could end up ruining a quest for one character by doing another quest for someone else, such as killing characters that one of the companions need to talk to. The only way to avoid this is to be careful whenever a quest leads to someone seemingly important dying, and to make progress on the companion quests as soon as possible. Beyond the companion quests, there is a vast amount of side quests available. Most of them are very well written, interesting and occasionally funny. Very few of them feel tedious, and there aren't a lot of traditional fetch quests, which is definitely a good thing. Quests range from solving murders to finding out what to do with a baby chicken, so there's certainly not a lack of variety. The same is true for the main story, which is interesting from start to finish, and rarely predictable. There are a lot of twists and turns, but it never gets too confusing. An interesting point is that, depending on the main character and the companions present, you'll get different pieces of the puzzle from time to time. It's not a big thing, and you don't need any particular character to make sense of the story, but it's a nice little detail. Also, you can initiate conversations with your companions, so if you need a certain tag or origin, it's entirely possible for them to do the talking. Occasionally, dialogues will be triggered when entering a room or approaching an NPC, however, in which case the closest character will be chosen. That can be a bit annoying if you prefer to do all your talking with a specific character, so it's something to be aware of. 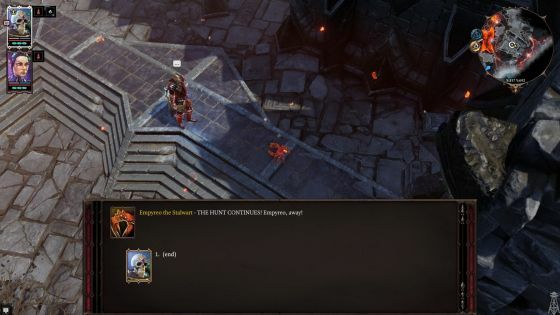 Given that I am still a big fan of Divinity: Ego Draconis, I was hoping for some more references to that game, especially considering the high amount of references to Divinity: Original Sin. I get that it's the predecessor, but in terms of timeline it's been about 1200 years since the original, meaning it's set right before Beyond Divinity and Ego Draconis. Also, I feel I should mention that there's virtually no hand-holding whatstoever. The last time I was left scratching my head as often as this was probably during Monkey Island 2 or some such thing. For the most part, I feel that's a good thing, but it happened a bit too frequently near the end. It started feeling like a lack of testing or polish rather than a lack of hand-holding, as certain quests are so vague it's basically down to "try everything" instead of trying to solve a puzzle or use clues. It's not really a surprise though, as the amount of ways to solve quests is staggering. I can't imagine what it's like to test every single combination of every single quest, as how you solve one quest often has an impact on something else. It's deeply impressive, and offers a level of choices and consequences I don't think I've seen since The Witcher 3. This, in turn, has an impact on exploration, because the order in which you do things actually has consequences. The game takes place in Rivellon, a world we have seen in quite a few games by now, and it's always well crafted. This is no exception, and the world is both beautiful and interesting to explore. That being said, it's still not a game that fully focuses on exploration; it's slightly more open than its predecessor, mainly because the areas are bigger, but each area is closed off. At certain points in the story, you get a warning that you're about to leave a certain area, which means it's a good time to finish off any remaining side quests, do a little shopping (or stealing) and chat to anyone you still feel like talking to. After that, any unsolved quests in the journal are simply closed with a note that says something along the lines of "we left without doing.. ". Given that the quests are simply not possible to solve any longer, this is pretty decent solution, but sadly it's currently bugged, as quite a few quests will be successfully completed, yield the proper reward, but still get some note on how some character died despite being saved. For completionists, this can be quite frustrating, but Larian has confirmed that they're working on a major patch to fix the remaining issues, so it might even be fixed by the time you read this. It's no doubt a result of the complex nature of questing in the game. As mentioned previously, the order in which you come across NPCs or do quests have an actual impact on future quests. Did you already talk to someone about this before meeting some important character? Bring it up in the conversation. In a few, rare cases it even determines whether or not someone lives, which I only noticed because I played through it twice. No indication is given that someone might die because you rescue someone else first, nor is there any indication that you could have saved them. It's actually a bit strange, as it's something you'll only notice if you play the game multiple times, and do things in a different order. Still, exploration remains interesting and rewarding throughout the game, and it's well worth exploring every nook and cranny. Larian's attention to detail is excellent, so there's always something to find, whether it's a hidden treasure, something funny or some interesting piece of information. Also, there are quite a few optional puzzles to find, most of which are related to quests, and they're usually well made. A few of them are a bit vague, or require a specific skill to solve, which can be problematic if you encounter the puzzle before obtaining the right skill, as there's often no indication that it's required. For example, "Spirit Vision" is an important skill gained through the main quest, that can be used to see spirits and similar. It's somewhat similar to the ability to talk to souls in Pillars of Eternity, though you're rarely hit by a similar wall of text. That particular skill should be used a lot while exploring, as it also reveals certain levers or patterns required for puzzles, which means you simply haven't got a chance if you haven't gained the skill yet. It's certainly not a major issue, but it wouldn't be a surprise if Larian decided to make certain things a bit smoother in a potential Enhanced Edition, elevating the game even further. Finally, I feel I should mention the atmosphere. Atmosphere is rather difficult to describe, as it's based mostly on how each individual player feels while playing the game. It's often a combination of music, graphics and world design, though even NPCs and their behavior can come into play. Personally, I kept thinking of Arcanum when playing the game, as both games have a fantastic atmosphere. There's just something about the feeling you get right from the start while exploring the first region of either game: The music, the color palette, the overall art design, the dialogues.. it just feels right. It feels good, and the feeling is there throughout most of the game. So where does all of that leave us? Well, it leaves us with a game that is almost unparalleled in this day and age when it comes to party composition and possiblities, top notch writing, challenging combat and an excellent atmosphere. Unfortunately, it still has a few bugs, technical issues and quests that are too vague even for someone who prefers no hand-holding. Nothing of it is game breaking, but it can be annoying to find out that the game didn't get saved properly because something happened between pressing the save button and the save completion message. Also, it's a bit annoying that the AI will automatically use just about every possible consumable available if the inventory is "known"; for example charmed party members or traders who you've traded with. In fact, the most challenging fight in the game is actually such a character, and that character will chug down about a dozen potions to become virtually immortal if you've done any trading. 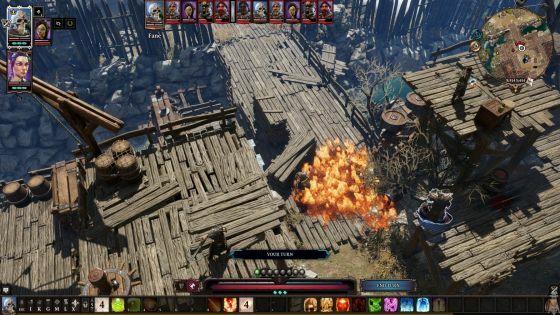 However, we do know that Larian is already working on a big patch to fix most known issues, and we also know that Larian has a habit of creating free Enhanced Editions, just like CD Project. For now, I actually can't give it a full score, despite enjoying it a great deal, but the potential is definitely there for this to become an all-time great if Larian decides to enhance it even further. The bottom line is that I've just played through it twice, spent well over 120 hours on it, and I'm already hoping for an Enhanced Edition so I've got a good reason to give it another go. All in all, I think it's fair to say that Larian has done it again.